The possibility to create multiple sub-ledger accounts (to assist with monitoring project spending). Getting started wasn’t as quick and easy as we thought it would be. We had some teething issues. As a secondary user on the banking profile with only viewing abilities it wasn’t straightforward to set up. Only the primary account user can see and access the information. This was resolved by creating a secondary user who would then be able to access and use the accounting system. Unfortunately after that the primary user and main account holder, Arthur Attwell, could not access to his own FNB Instant Accounting profile. To date this has not been sorted out. One of the nice features that FNB Instant Accounting has is the ability to automatically assign transactions to general ledgers using rules. FNB starts assigning some of your banking transactions for you that it recognises before you even start. These include banking charges, telephone expenses and so on. This would have been lovely feature to use. However, we needed to keep track of transactions per project and therefore needed to manually allocate transactions to their various related sub-ledger accounts. I had repeated instances in the early stages where I had disabled the rules and FNB re-enabled them again. After contacting FNB to have this feature disabled it was fixed by the end of March 2013. One thing that I have found incredibly frustrating is the length of time that it takes for the program to load a transaction, refresh and update the data. The pages just hang and it takes ages to capture one manual transaction after another. You can only press save once otherwise you end up with duplicate transactions that you then need to create multiple reverse entries against. For those of us who can multi-task and have two separate screens to work on, this is not too much of a problem. Most of the time this means that the transaction has been captured but it’s best to double check. Fortunately I had no need to capture invoices in Instant Accounting so I have not experienced issues here. If you need to keep track of debtors and creditors there are some useful discussions available for managing your accounts and VAT returns in Instant Accounting. More issues that I experienced were with a split transaction that become corrupted while Instant Accounting froze. This meant that I ended up with a trial balance that didn’t balance. This was resolved with the help of support. After this the bank balance did not match the actual bank balance. Since I was not able to add or remove transactions that are automatically imported, support was needed to assist here as well. The support team did not let me know when they had made changes and what changes they had made. These turned out to be wrong and so I needed to go back and advise them again. Since then, they have made an effort to let me know what changes they have made. One day in January 2013 I logged into Instant Accounting and was pleasantly surprised to see that our income had dramatically increased – only to realise that I was logged into another unrelated company’s profile: Women in Finance. Unfortunately this also meant that I could not access our own accounting profile. I forwarded screen shots to FNB to prove that I was in the wrong accounting profile and they changed my profile back to having access to Paperight’s financial data. Trying to find transactions and view historical data is not that great. To search for an amount, you need to know the exact amount you are looking for in order to pick the transaction. Trying to view historical data can be time consuming. FNB Instant Accounting decides for you what you want to search for. Even if you select the previous financial year and select to view all transactions it will still search for transactions within the current year. You then have to clear the filter items it has chosen and start the search again. The most recent issues experienced were the scroll option no longer working for selecting ledger accounts. It was recommended that I use a different web browser. Later on I was not able to access my ledger accounts at all. Each time I tried to access them Instant Accounting would freeze and log me out. It turned out that I had too many ledger accounts and was asked to delete some of them in order to continue working. All in all I have been much happier using FNB Instant Accounting than FreeAgent, Wave Accounting or Omni. As long as you don’t need a program that works quickly (especially in the mornings) their system works okay for entrepreneurs and start-ups. Most of the bugs mentioned have since been fixed. Arthur’s fellowship with the Shuttleworth Foundation began 1 September 2011. He has received in total three years of funding which have been used in 17 projects which make up the total Paperight project. The process is well organised and thoroughly monitored by the Foundation. We submit detailed pitches which are analysed and discussed before being approved. Memorandums of Agreement are created for each pitch and signed by Arthur and the Foundation’s representative. Invoices are submitted against each project and are tracked. At the end of each project, detailed closing reports are done and the remaining funds which have not been spent are returned to the pool. This is the first Paperight project pitched to the Shuttleworth Foundation. The plan for this project was to hire a core team, build and launch a minimum-featured beta site with automated content licencing and acquisition. The project went better than expected and took four months instead of three. A large portion of the funding requested for this project was put back into the pool to use for other projects. Our budget included a senior developer, a content manager, office costs, interns, registrations, and two laptops. The difficulty of getting commercial publishers to provide content to new businesses. The plan for this project was to promote outlets and customers while launching the instant-delivery website. The big goal was to get 100 outlets to register on our website and have 1000 documents purchased within two months. It took over two months to get 100 outlets, some of which were not viable outlets. In the first two months we sold about 100 free documents, and it took ten months to sell 1000 copies. Our budget included three months salaries for an outlet manager, a marketing consultant, a content manager, travelling costs, advertising costs, three computers, office costs and Adobe CS5.5. Very few outlets were advertising their Paperight service. Those who did advertise made sales. The concept was very new to outlets. Our marketing did not reach customers. Our catalogue consisted of a small range of material. We had few products to sell which were in demand by customers. There is generally a low interest in the books which we had available on our site to purchase. This project was for creating the first release of the current paperight.com. We contracted Realm Digital and the project went really well. All objectives were achieved. We learnt that it is always necessary to test your own coding and websites over and above that of the developer testing. Our budget included complete basic frontend components (landing, registration and profile pages, account-credit topup page, catalogue page, licence purchasing page, manage licences page, manage meta data page) and complete basic backend components (account credit management, user search and language page, doc search and manage page, licence search and manage page, PDF watermarking). We planned to move to a formal office space and set up the office infrastructure. All objectives were achieved, the team settled in straight away, enjoyed their new working environment and productivity definitely increased. Our budget covered office furniture, rent, stationery, telephone and general office costs. We wanted to extend two existing contracts, create two new positions based on new needs and priorities, and allow us to bring in more interns. We first extended our contract positions: Our Chief Operating Officer (Tarryn Ann Anderson) and our Creative Director (Nick Mulgrew). Then we added new positions: Our Financial Manager (Dezre Little), and our Business Development Manager (Yazeed Peters). For our interns we found: Philippa Dewey as our Content Manager, Oscar Masinyana our Reading Communities Manager, and Marie-Louse Rouget our Marketing Coordinator. The team worked really well together and all were amazing team members. Our budget included three months salaries and three new laptops. Managing a team is an ongoing learning process. Arthur found giving each team member their own simple functional authority, and clear reporting lines helped to create ‘job coach’ relationships rather than task-based managerial relationships. The process of including the team in the employment selection process meant that a team was created who bought into their team members success, built strong and loyal relationships where everyone is naturally interested in assisting their colleagues in both their career and personal development. It helped a great deal that all team members valued each other as experts in their own area of work, and therefore saw each other as equals and relied on each others strengths wherever possible. This project was originally written in three parts and then added together to make up what was finally Phase 2.1 and 2.2. As with most development projects, it turned out that more development was needed as Paperight progressed. Overall this project went very well, thanks to good preparation on our side and great professionalism by Realm Digital. The work included building 3rd party product integration and product ownership functionality. Here we collaborated with Live Magazine, placing a full-page advert in their magazine. The full-page ad featured a story-like cartoon highlighting our Let’s Talk About Varsity and Project H (a graphic novel) . The piece was well executed but there was no discernible increase in sales. Our team is established and we started focussing on scaling our reach. This project created a year long foundation of infrastructure. We created our Paperight targets and goals to achieve over the next year. 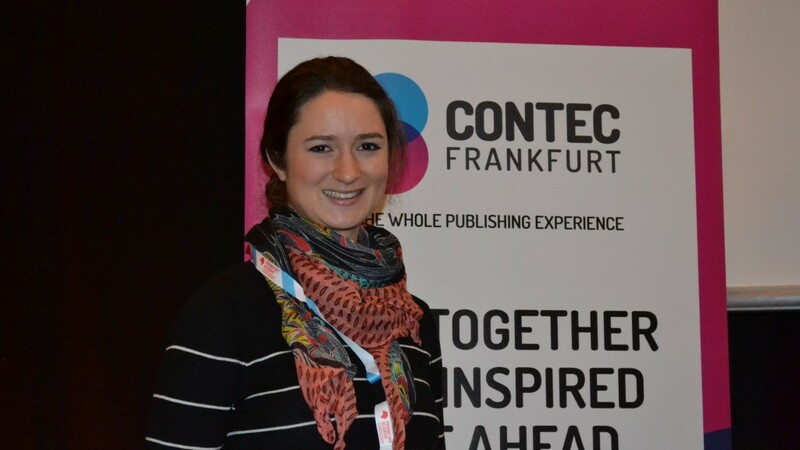 We sent Tarryn to the Frankfurt Book Fair to develop contacts and build relationships with international publishers. Great relationships were created and additional publishers signed up as a result. Trademarking Paperight in South Africa, the US and Europe. Total spend: Still current, we expect a total cost around R100 000. We sent Tarryn to the London Book Fair to develop contacts and continue to build relationships. Again this was a great success. A ten-week course on selling for our Outlet Development Manager Yazeed Peters, intended primarily to boost sales from outlets to bulk-printing customers, resulting in revenue for Paperight in rights and service fees. This project was for creating and publishing Now What?, a short book on how to succeed as a UNISA student. The third major phase of software development on Paperight.com. Our next pilot project to add dynamically designed food packaging print-outs on paperight.com. Only kidding –this was our April fools joke for the Shuttleworth Foundation. We loved writing is as much as they enjoyed reading it. Initial marketing budget and plans for 6 months, including staff, September 2013 to February 2014. Some of our outlets approached us saying that they would be more comfortable using our service if we would operate on a credit system, giving them the ability to spend credits and pay later. We increased the topup values on our outlets accounts by paying the money ourselves which the outlets then owe to us. The benefit for the outlet is that they do not need to make a top-up before they can make a licensed sale to their customer. The outlets we tried this system with did not feel as though they had invested into the service that we provide and therefore were less motivated to sell our products. Chasing up for payments with outlets is a time consuming process. We would not be keen to offer this service in the future. One of my first assignments at Paperight was to meet with our accountants, Wolfsohn and Associates, to establish whether we needed to register for VAT and whether our grant income received from the Shuttleworth Foundation would be zero-rated or not. After many discussions and meetings we confirmed that Paperight should in fact be registered for VAT as the grant income from the Shuttleworth Foundation should be recorded as income, but that the income would be VATable at zero percent. We also established that we could claim 14% of input on VAT charged. We needed to be registered for VAT for 1 January 2013, and we agreed that the best method for Paperight was to act as an agency and not a principal. The grant from the Shuttleworth Foundation comes from an overseas base and is received for specific projects which are monitored. All grant income received from within South Africa would attract VAT at 14%. This meant that our website needed to be updated to take VAT into consideration on all documentation, sales calculations and reporting. Acting as an agency, only our 20% commission received is recorded as income in our books. The top-up and publisher earnings will be monitored with control accounts. The turnover will then be 20% of the sales made inclusive of VAT as per our agreements with publishers/rightsholders. The suspense accounts will be reconciled on an ongoing basis. The suspense accounts must agree with rightsholder statements. Output VAT will only be applicable on Paperight’s 20% commission. All commission is VAT inclusive and 14/114ths must be paid to SARS. All invoices will be automatically generated on paperight.com based on the information received from rightsholders and outlets. Statements will be drawn which reflect the all invoices and commission earned in one month. The commission income earned from each rightsholder, and the licence fees earned by each rightsholder is captured in the accounting system at the end of the month. As the agent we prepare all invoices on behalf of the publisher. The invoices are created from the publisher (the principal) to the outlet (the customer) for 100% of the value of the licence payment in rands. The currency will reflect in Rands and USD. Paperight issues an Agent Sales/Tax Invoice on the rightsholder’s behalf. If the publisher is VAT registered then the invoice includes 14% VAT on the total licence fee. If no then it doesn’t include VAT. Our rightsholders need to give us their details in order to reflect this correctly. Paperight attracts 14% VAT on commission earned from the licence sales. Note: the same situation applies to this case as it does when Paperight invoices overseas Publishers. No VAT is charged. This information must be according to their tax and advised within their agreement. All Invoices made to outlets are done in the name of the Rightsholder/Principal. Invoices include or exclude VAT dependent on publishers’ VAT registration details being supplied. Paperight will provide the rightsholder with an Agency Sales Statement/Tax Invoice for sales made during the month and the corresponding commission earned by Paperight at 20% inclusive of VAT. The invoices clearly state Tax Invoice as well as Agent Sales Statement. We act as an agent on behalf of all publishers/rightsholders. 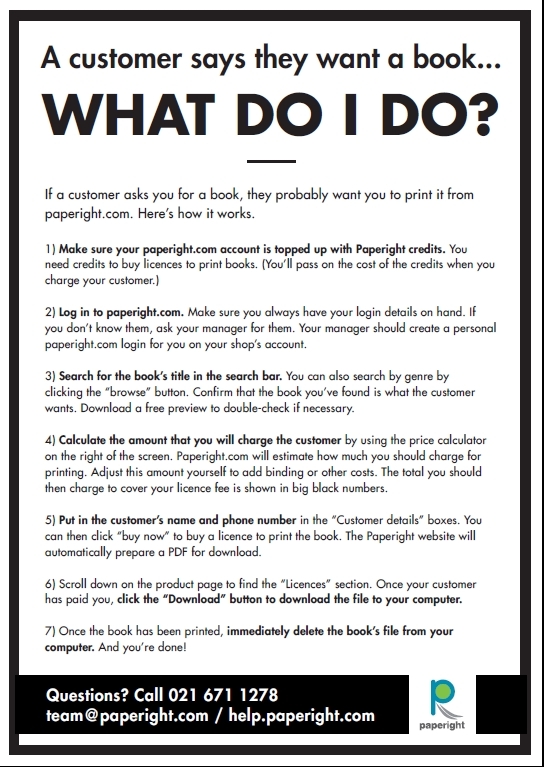 Our contract includes a clause that says that the publisher gives Paperight a non-exclusive license to deliver the PDF to the copy shop and to collect the rights fee in return. 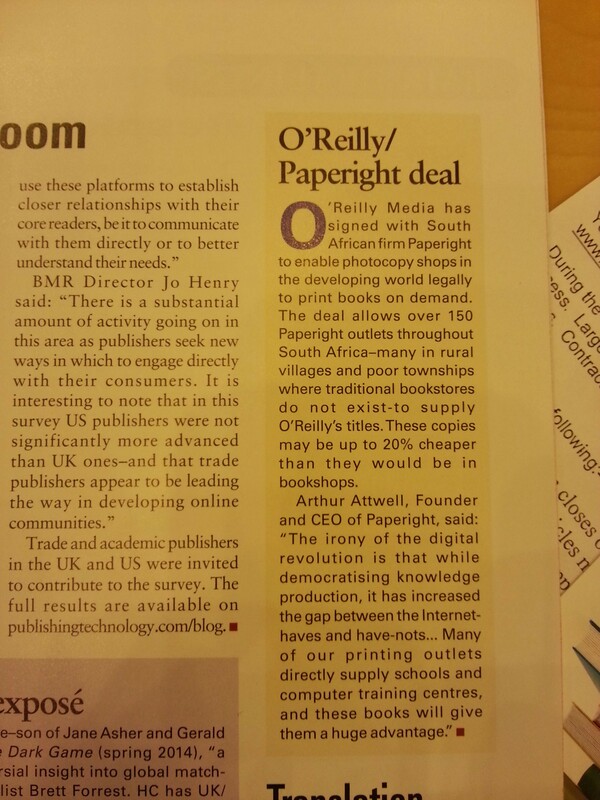 Separately it says that Paperight will pay 80% of that rights fee to the publisher. It also notes that we are VAT registered and that the commission invoice is inclusive of VAT. Rightsholder earnings are held until the publisher requests that they be paid out. This is done through the paperight.com website. The length of time that that money is held does not change the value in Rands. The exchange rate is calculated and recorded at the time of purchase and not at the time of withdrawal of credits. Important where the outlet and the publisher’s working currencies differ. Existing publishers are updated on the changes and information received. The commission invoice to the publishers includes Rand values, inclusive of VAT. the legislation has been clarified further to the effect that services supplied to a non-resident may only be zero-rated if the services are supplied directly to that non-resident, or any other person, AND both the non-resident and the other person are not in South Africa at the time the services are supplied. Because an agent may not want to disclose to his principal who he sold to, or who he bought from, (or how much profit he made) he may keep copies of the tax invoices he made out for the sales or the tax invoices he received for purchases on behalf of his principal. The exchange rate is not shown but is based on the Yahoo! exchange rate which has been built into the paperight.com website. Our 20% is currently inclusive of VAT for all rightsholders local and international. We are not paying for VAT on the full amount but on 14% of the 20% commission earned. For each R20 rand out of R100, that would equal R2.46. We are making 17.5% on every book purchase that is not Paperight owned. The outlet registers, VAT number and address required. The topup is received and voucher value is recorded on their accounts page. No tax invoice or invoice is issued when receiving credits. Only actual downloads are invoiced for the outlets will receive an invoice upon downloading a printable document. The invoice will be downloadable directly from the website. The invoices contain 100% of the sale, include the Publisher’s details. The invoices include VAT based on the VAT status of the Publisher and not Paperight. The credit value and the exchange rate value in rands will be stipulated on the invoice. When a publisher registers they must provide their VAT registration number and liability start date if applicable. This information will be pulled through on the the valid tax certificates created for each sale. When the outlet downloads a book, a copy of the invoice is available on the outlet’s dashboard to download. When an outlet downloads a book they receive an invoice from the Publisher. Outlet invoices are saved on the outlet dashboard and available to download at any stage with applicable VAT, depending on the Publisher’s details, for the full value of the transactions. Paperight has access to all the invoices that have been made. The invoices and statements sent to outlets are accessible to the Paperight accounts team. The accounts team have access to the server and are able to search by outlet or publisher for the total invoices issued over a month. The data can be exported in csv format. The most significant cells for importing data into accounting programs are the date and currency format. Admins are able to log in and download copies of invoices where necessary. The rightsholders each have access to their own dashboard so that a copy of their monthly statement is available to download. They can also view the balance of the money due to them. The rightsholders are also able to request a payment for earnings from their dashboard on the website and forwarded through to accounts. Paperight’s accounts administrators are then able to mark a publisher’s request for withdrawal as paid and the balance is updated on the website. Payment in a foreign currency will always need to be converted into rands for the accounting system. The Yahoo! exchange rate used is recorded for each transaction. The exchange rate is captured on the date of the first time the document is downloaded (the effective date of the final licence payment), to show the ZAR value at the time of sale. This information is reflected on the statement between Paperight and the Publishers to show them how the rate has been calculated. The rate used in capturing the Publishers commission received and balance off the entries in the accounting program are also reflected. October saw us participating in the CONTEC Startup Showcase in Frankfurt. The showcase formed part of the CONTEC Conference which was attended by industry leaders in digital publishing, and focused on the connection between content and technology. Paperight was expected to offer a 3-minute pitch, against five other innovative start-ups in digital publishing. We were selected as the winner of the showcase by a panel of judges. As was the case after our London Book Fair win, the discussions had after the award announcement, and in the tea breaks just before, were very productive, with a lot of excitement about our project and aims. In particular, the Brazilian publishers in attendance (Brazil was to be the market-focus for the book fair that year) were very enthusiastic about the possibilities for Paperight in the Brazilian and wider South American market. My focus for the fair was on publishers who could provide content that was in line with our current marketing focus. Namely, early childhood development materials (for children) and research (for teachers/caregivers), core textbooks and study materials for grades 10, 11 and 12 learners, core reading material for first and second year university level students, and trade fiction for young adults. I had many productive conversations, and furthered negotiations with several big publishers (including Elsevier, Harlequin, and Bloomsbury). While I was optimistic about the possibility for Bloomsbury signing on with us, and while they were very receptive in our meetings, they later decides to hold off until after their South African distributors, Jonathan Ball, had had a chance to pilot the system. We continually found that it was imperative to follow up on marketing material like this, be it with outlets, or schools, as often things would fall through the cracks otherwise. While I was away, Philippa held the fort, and continued the process of uploading documents in the backlog queue, and Marie completed content tagging. Following my return from the fair, I completed the usual feedback reports, and followed up on the posters we’d distributed to schools (to make sure these had been put up and the flyers handed-out). 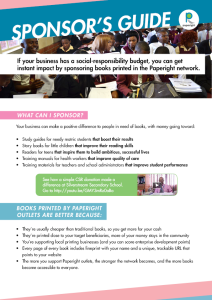 We continually found that it was imperative to follow up on marketing material like this, be it with outlets, or schools, as often things would fall through the cracks otherwise. Dez and I also completed the Gifted Citizen Award Application on Arthur’s behalf. Given the difficulties in getting content timeously, specifically as a result of the long lead time when signing publishers, we revisited the discussions (recurring over the last year) of creating our own content. It was around this time that we had been talking to Pearson about making their backlist (some of which included important African literature titles) on Paperight, only to find that this would not be possible due to the fact that font-licensing issues meant that these would have to be re-typeset, and the cost of this was just not a viable option. In our in house discussions about increasing the pool of books published/available in African languages, we began to envision a translation project for popular international YA titles into isiZulu and isiXhosa. This lead to my applying for rights to translate Harry Potter, Twilight and The Hunger Games (a project that is still on going). 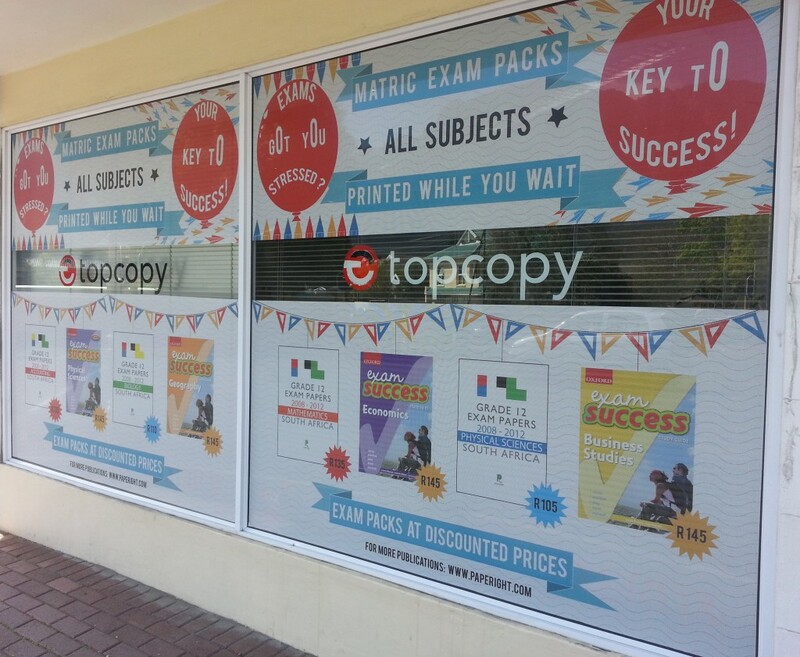 Another of our projects for content creation revolved around matric exams, and the fact that the changes in curriculum meant that past exam papers would no longer be as relevant for students. 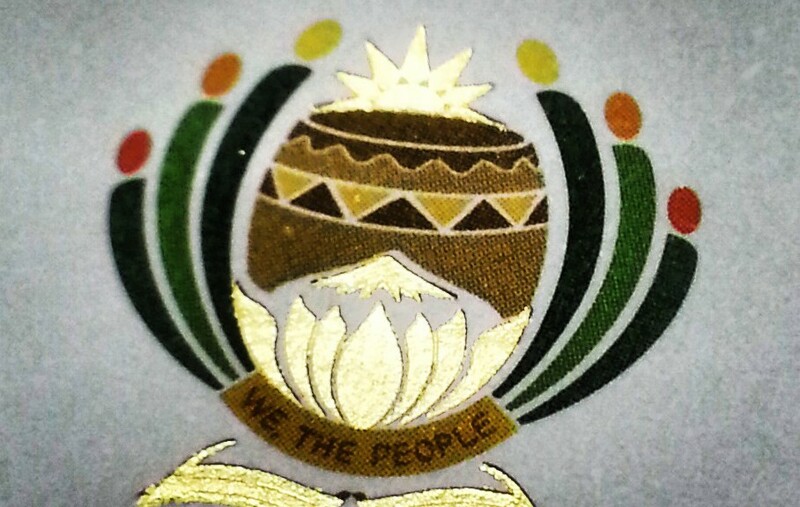 We contacted Siyavula about a collaborative project to develop a bank of open CAPS-aligned maths questions for grades 11 and 12, but while supportive of the endeavour, their current commitments precluded any involvement on their part. Instead, we looked into hiring an intern to assist us in the creation of a question bank. We’d increasingly been concerned that we were not close enough to reaching sustainability, and we’d ultimately need to shrink the team in order to extend the funding runway. October was also the month in which we decided to plan for and prioritise a university marketing campaign as a “Blaze of Glory”, last ditch effort to see if we could gain enough traction in the university market to avoid having to make a serious pivot within the next six months. We’d increasingly been concerned that we were not close enough to reaching sustainability, and we’d ultimately need to shrink the team in order to extend the funding runway. As a team we started brainstorming the #textbookrevolution. Part of this planning lead to us focussing our attention on university prescriptions. I set up a database of prescriptions, and worked with Oscar to flesh this out. 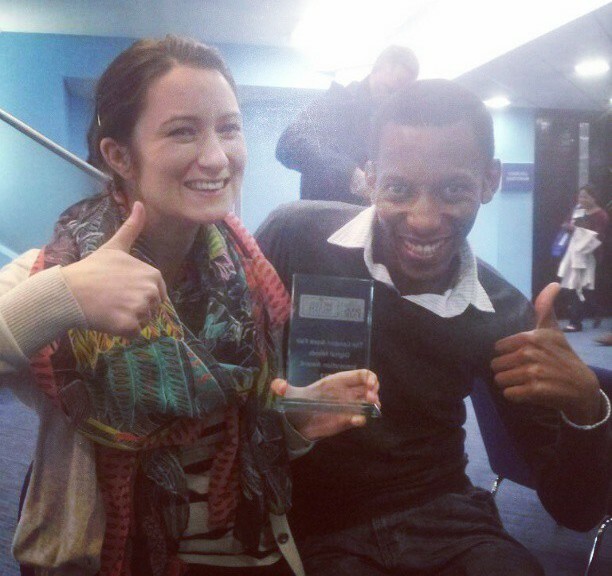 April’s main preoccupation was preparing for the Digital Minds conference startup innovation contest. It was the first time that anyone other than Arthur had presented Paperight to a large audience, and Oscar and I were planning on being a well-oiled machine by the time we got on stage. We wrote and re-wrote our respective speeches, and practiced until we were reciting the speech in our sleep. In amongst that, we spent time chatting with Pearson Future Technologies about a meeting in London; Yazeed and I met with UWC library about incorporating Paperight into their library services; I met with Macmillan again; and we had a debriefing meeting with TWP to talk about the progress of Now What? While I was at the Book Fair, and once it was over, the team was focused on processing of Mindset Learn materials, and sourcing missing content and cover images. Diann was working on ABC titles, Philippa and I on Mindset and College Campus titles, and updating of Matric Exam Packs (including uploading new PDFs and updating metadata), and New Africa Books. Oscar was in the process of mapping curated categories to Amazon categories, general curation duties, and updating of page extents and descriptions on content master, and content tagging. On Sunday the 14th of April, Oscar and I arrived in London, only to find that they would only allow one of us to present on stage. We reworked the speech, and I delivered it solo at the Digital Minds Innovation Showcase – though Oscar’s presence still very much came through in his story, and it was good to see his reassuring face in the audience!. The showcase formed part of the Digital Minds Conference, annually held before the London Book Fair, and attended by industry leaders in digital publishing. Paperight was expected to offer a 4-minute pitch, against seven other innovative start-ups in digital publishing. We were selected as the winner of the showcase by popular vote. After our win, everything else seemed easy! Oscar and I attended the fair from the 15th to the 17th April. Our aim was to build on existing publisher relationships and approach new publishers. Additionally, we were to pitch Paperight as part of the Digital Minds Innovation Showcase at the Digital Minds Conference the day before the fair. Oscar’s trip was funded by the Department of Trade and Industry, as organised by the Publisher’s Association of South Africa. As part of the sponsorship, Paperight was given a table on the South African National Pavilion at the fair. This allowed us a place to meet with publishers, and a space within which to display Paperight-branded materials (our roller-banner for example). The overall response to Paperight was very positive, and we signed our contract with O’Reilly Media at the fair: a fact that was reported in the show-news for the day. Post Fair, I focused on follow ups and Base Admin, as well as completing a feedback report for the team, the Shuttleworth Foundation, and the DTI. In February 2013 the team published a great little book called Now what? A guide to studying with Unisa. Here’s our blog post about it. We also produced a printable Paperight catalogue. I also gave a talk in Jan at TEDxAIMS in Jan called ‘Tech spreads slowly.’ Here’s the video and text. I reproduced that as a post on the Mail & Guardian’s Thought Leader blog. 29 Jan 2013: Nalibali interview with me published in their supplement in The Times, too. 19 Feb 2013: the Knowledge Bridge blog of the Media Development Investment Fund wrote a nice piece about us titled ‘South Africa’s Paperight holds opportunities for long-form journalism‘. 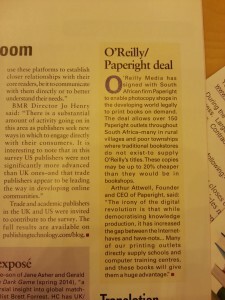 28 Feb 2013: Post on Paperight in Forbes, arguing that Paperight could also be important for UK bookshops and post offices. 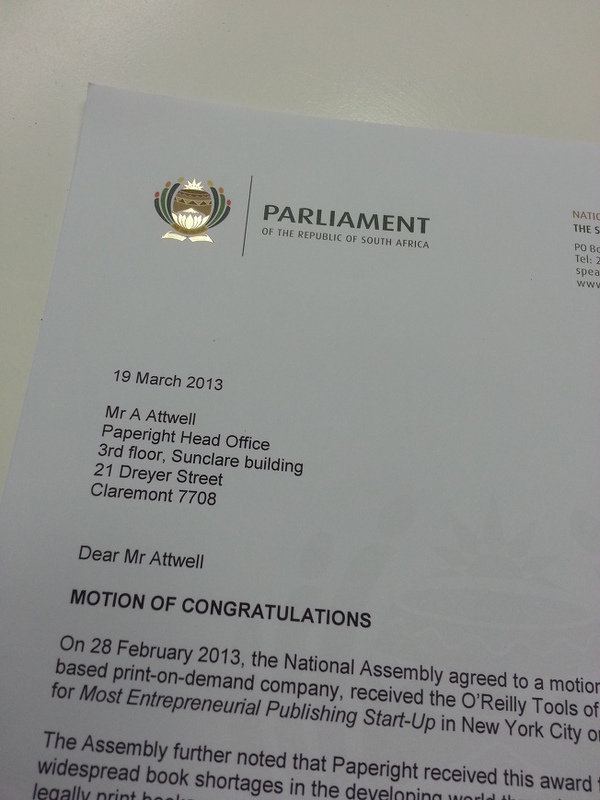 The highlight was that on 28 Feb 2013 The National Assembly of South Africa (Parliament) congratulated Paperight! (6) congratulates Paperight and encourages publishers to register with Paperight in making their works accessible to all. Agreed to. Promotional campaigns around the Paperight Young Writers Anthology, the Now What? UNISA guide, and planning promotional campaigns around healthcare and young-adult titles. Boost content team to clear the backlog of books we have, including over 150 student guides for distance-learning university College Campus. Complete negotiations with two major US publishers (O’Reilly, Harlequin) that have been ongoing for a long time. Aim to sign MOU (or similar) with Postnet. Last phase (Phase 3) of software feature development, including A5 printing, high-res covers, and VAT support. We’re on track with our early-stage financial targets. The Indigo Trust focuses on funding technology-driven projects to bring about social change, especially in African countries. We thought that it would be a good idea to send them a concept note for web-based software that we wanted to develop. This software would replace postage in distance education, bringing textbooks within easy and affordable reach of students countrywide. Higher education in South Africa is heavily dependent on distance education. South Africa’s biggest distance-learning institution, the University of South Africa (UNISA), has over 350 000 students. Every one of those students gets something in the post, ranging from administrative documents to learning materials. The post is unreliable. Sometimes the wrong materials are posted. The institution never knows whether the package arrived at its destination. As a result, some institutions like UNISA are implementing compulsory online study for many students. This is a problem: two-thirds of South Africans have no Internet access, even through mobile phones (according to South African census data). If you can’t afford internet access, or if you live in a place where personal Internet connections aren’t available, you can’t study through UNISA. According to UNISA’s announcements, the shift to online learning is part of helping their students adapt to the digital age. In reality, the shift to online means that higher education is becoming even more inaccessible. 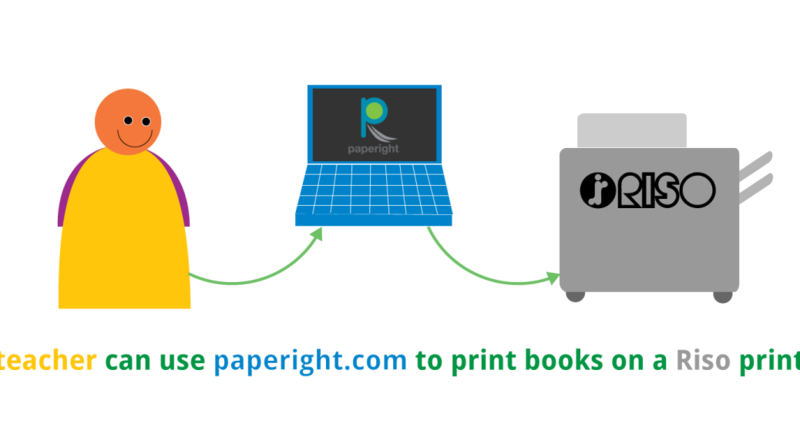 We believe Paperight can provide an alternative. 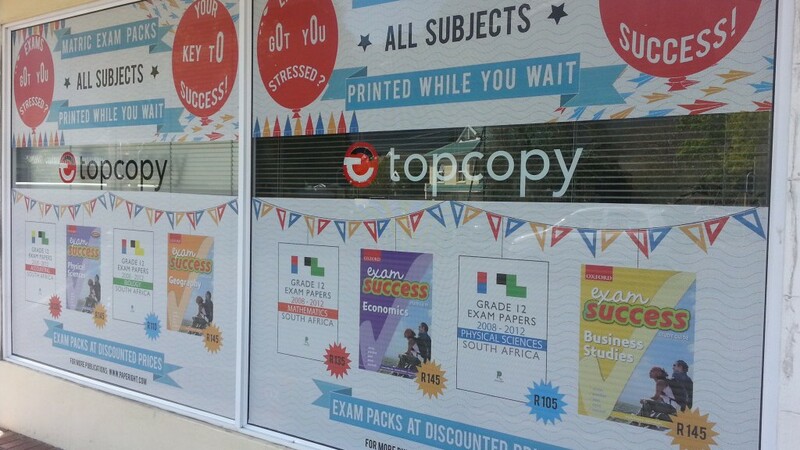 Imagine if any student could walk into any copy shop (or NGO, church, or community centre), hand in their student number, and have the books they need for their course appear on the Paperight screen for instant printing. The student would print what they need only when they need it. No waiting for the post to arrive. No travelling to the post office – instead, any nearby copy shop would do. And the institution would know as soon as the student had collected their materials. Plus, we’d reduce the carbon footprint of shipping printed materials around the country. This service could be also used by any organisation that needs to get documents to specific people, such as trade unions, churches, schools, clubs, or journals with subscribers. The Trust thought that our approach seemed to be a more efficient way of doing business than is currently happening, unfortunately this did not fit into their definition of social change, and we were unsuccessful this time around.